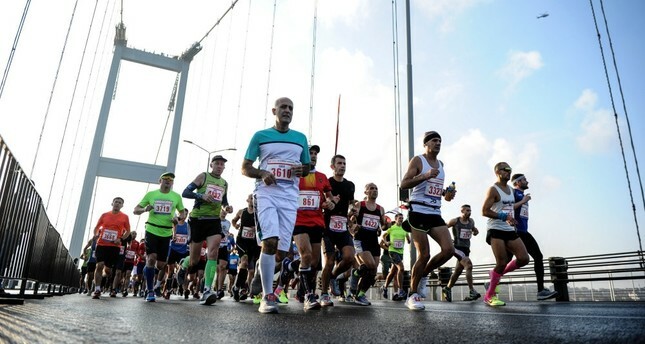 The Vodafone Istanbul Marathon, which takes place on both European and Asian continents, is scheduled to take place Nov. 3, 2019. The Geyik Koşuları Trail Series are a series of runs held in Istanbul's Belgrade Forest. This year's runs will take place Sunday Feb. 17, June 22, Oct. 13 and Dec. 8. The categories include a 4K, 14K and 28K and kids courses. The date in June will be a night run. On Sunday Feb. 24, the Istanbul Ultra Trail Mud Race will take place in Çekmeköy in the categories of 9K, 15K, 30K and 45K as well as a 30K bike race. Organized by Team Ultra Trail Runner, they hold a number of races in Istanbul throughout the year to keep your eye out for. On Sunday, Mar. 3, Runatolia takes place in Antalya with a half and full marathon, a kids' run, the 4k Terra City run and its unique "high heels run," in which women race in 7 cm heels. The Latmos Ultramarathon is a 45K and 17K that will take place on Saturday April 6 predominantly on a footpath along the Beşparmak Mountain range where the provinces of Aydın and Muğla meet. The run sets out from the village of Bağarcık and leads to the majestic Lake Bafa and its adjacent historical village of Kapıkırı. The Vodafone Istanbul Half Marathon consists of a 10K and a 21K road run along the coastal road between Yenikapı and Sirkeci that will be held on Sunday April 7.
discover Muğla's Datça peninsula, which is easily accessible from both Bodrum and Marmaris. Turkey's longest single stage running race, the İznik Ultramarathon, held on trails and around a lake in the historical Iznik region of Bursa, aka Nicaea, takes place over the weekend of Aril 19-21. The longest race has been increased from 140K to 160K this year, with solo and two or four-person relay options. In addition, there will be a 90K, 55K, 35K and a 5K taking place over the weekend. The racing season dwindles in the summer season due to the sweltering heat with the exception of the Garmin Runfire Salt Lake Ultra Trail, which will take place July 26-28 in 10K, 20K, 40K, 80K and 100 Mile categories on the salt lakes in Şereflikoçhısar, which is located between Ankara and Konya. The season then picks up in September with the Kaçkar Ultra Marathon held in this mountain range that rises over the Black Sea Coast and the Lycian Way Ultra Marathon, which takes place on the historical trail that spans hills over the coastline from Fethiye to Antalya and held Sept. 27-29. The Frig Valley Ultra also takes place in September and is a trail run that visits castles in the Frig Valley of Afyonkarahisar. In October, the marathon season heats up with the Bodrum Half Marathon scheduled for Oct. 6 and the Türkcell Gallipoli Marathon normally held in mid October. While this is a great time to visit the popular summer holiday resort town of Bodrum, it is also a wonderful season to run along the historical battlegrounds of Çanakkale. The Kaş Yarimadaton, which will be held on Oct. 12, is also a great run and opportunity to visit this beloved summer holiday spot in Antalya. Meanwhile, the Salomon Cappadocia Ultra-Trail is perhaps one of the most magnificent runs in the country as it takes participants through the valleys and hills overlooking the unique fairy-chimneys of the region. One of the most famous races in the world, the Vodafone Istanbul Marathon takes place Nov. 3 and allows runners to cross continents. Bodrum Ultra, which is a course that goes through the town as well as the trails on the hills overlooking Bodrum, takes place in November and the year caps off with the Ida Ultra Marathon, which takes place through villages in the Kaz Dağları (Ida) Mountains in Çanakkale.